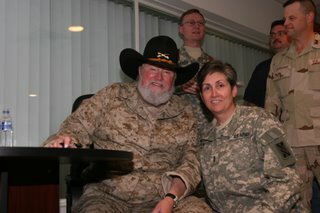 I'm totally bored.......I have been at Ft. Rucker for 3+ weeks now attending the Warrant Officer Staff Course. Parts of it are pretty good -- but parts are extremely boring. They are attempting to rewrite the course, and we're supposedly the "last" class that has a lot of "research" time! There's only so many stores and movie theates than can be researched in southeastern Alabama. I drove to Mobile one Saturday afternoon to visit "Uncle Bob". Had a delightful time seeing him and Doris and getting to meet Doris' family. Great visit! I drove to Atlanta to see my cousin Sheryee and husband Robert -- I felt like I was visiting at the Ritz! Wow -- do they know how to entertain!! Terrific food (Robert is a REAL gourmet cook!) and great laughs and conversation. I'm waiting for the calendar to tick by -- 3 more wake-ups and then I'll be on my way home! My duffel bags are packed. I gave away the pink bike. I've sent the last of my emails here in Kuwait, and I am headed home!!!! It's been quite a year -- all 338 days of deployment. I've been to Iraq, Afghanistan, and here in Kuwait. It's been hot, hotest, and hotter!!! 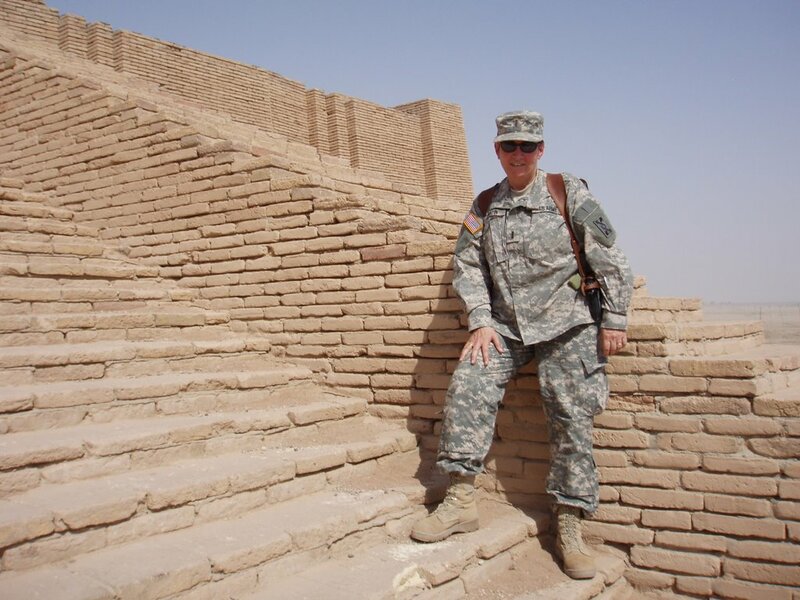 I've lived through the rainy season in Baghdad -- where we all had at least an inch of mud on the bottom of our boots. Couple the mud with the gravel from the places lucky enough to have anything other than mud -- and the boots turned into death traps -- because we would "skate" across floors with the rocks stuck in the bottom of our boots! I'll try to continue posting and will continue to keep the name of The Desert Chief. Once a Chief lives through something like this -- it's a proud title! I was recently back in Iraq (for a short trip!) 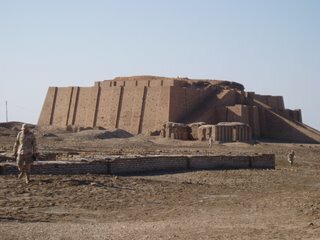 and visited the Ancient City of Ur. How fascinating. It's believed to be about 4300 years old, the oldest known form of civilization on earth. The large temple is the Ziggurat of Ur, which was built as a temple to the Moon God. The City is approximately 20% uncovered and it was done during during a 12 year period in the 1920s-1930s. Also at the site is the House of Abraham -- a house with 28 different rooms. The picture of me on the steps is half-way up the stairs of the Ziggurat. All of the city is made from bricks (made of sand and held together with tar) -- very interesting!!! It's hard to believe this country was once known as the "promised land". Makes you wonder what their prospective was like! 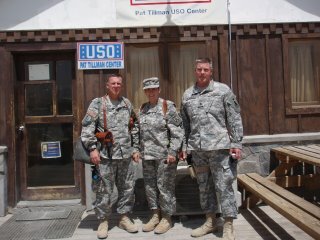 About a month ago I was in Afghanistan. The Pat Tillman USO Center is right across the street from the Air Passenger Terminal. We spent a lot of time there (I travelled with two fellow team members) as it was pretty much the hub of Bagram. The country is absolutely beautiful -- gorgeous weather, breath-taking scenery -- how unfortunate it's riddled with bad dudes running through the mountainous terrain! A little cultural update is in store with this blog post. Recently, we went on an MWR (Morale, Welfare, Recreation) trip. They load 25 of us on a bus, and take us somewhere usually fun or interesting. 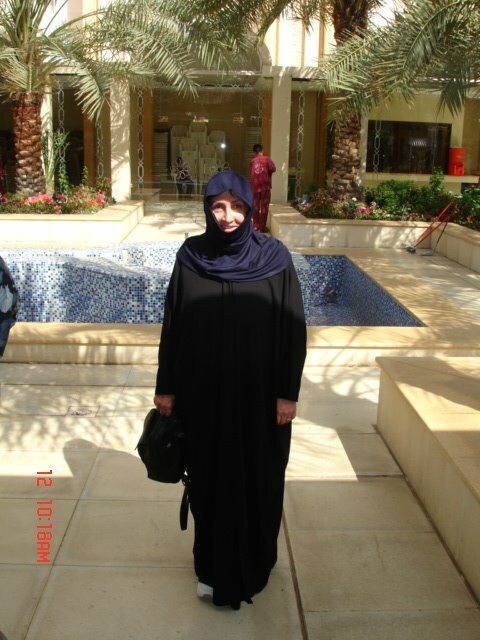 When I first got here to Kuwait, we were not allowed to ever go into a Mosque, walk near one, or stare at it. Well.....they changed the rules and took us on a trip to the Kuwaiti Grand Mosque. It's the 5th largest Mosque in the world, and will hold about 14,000 at one time inside, and 45,000 - 50,000 on the entire grounds (inside/outside). It was truly beautiful and the pictures don't do it justice. 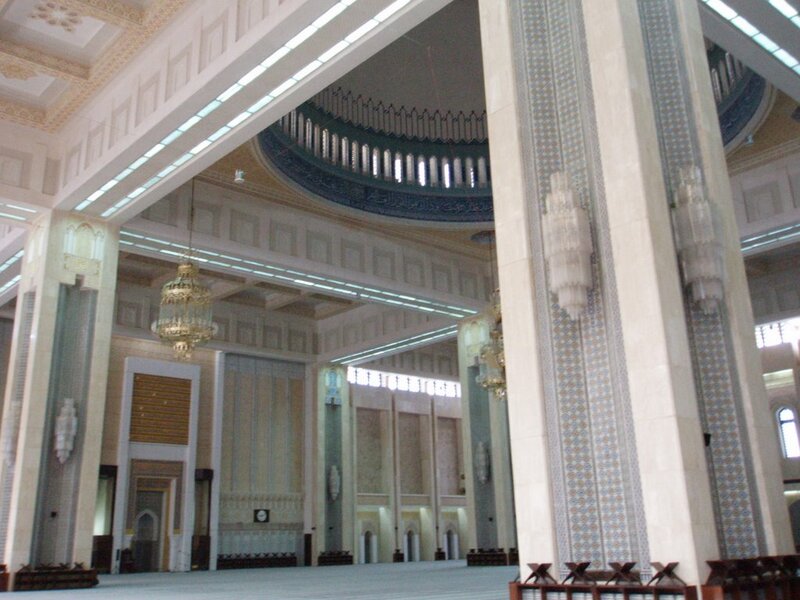 The Grand Mosque took almost six years to build and was fortunatly spared during the Iraq Invasion in August 1990. There is a little bit of damage (cracks in major spots) that suffered from all the bombing around the Mosque during the invasion, but the building is in fine beautiful shape. The intricate detail in the marble and wood carvings are unlike I've ever seen. When we went into the Mosque, all the females had to put on an abaya. It is the black overgarment, including covering of the head, that all the women wear when they are out in public, much like we put on a coat. In their own homes, they wear brightly colored beautiful clothes to impress their family members (mainly their husbands), but outside -- they are supposed to draw attention to no one -- therefore, the black overgarment. In the picture (above), that's me, complete with the white tennis shoes sticking out!!! After our visit to the Grand Mosque, we went to the City Centre Mall. It was relatively a small mall, but with fun little shops to go into. Most of the women were in the black abaya, however I think they forgot about the part that they're not supposed to draw much attention to themselves. I noticed the black overgarments were very beautiful -- beads, jewels, fringes, and much adornment on their beautiful abayas. My opinion -- the culture is changing -- while hanging on to the old customs. It reminded me of how some schools in the U. S. will put kids in school uniforms -- the kids will merely find another way to make a fashion statement -- hair do-dads, jewelry, shoes, etc. That's all for today! Hope you enjoyed the Kuwait culture lesson! P. S. Go Spurs Go!! On to Round 2, and to beat the Mavericks!!!!! 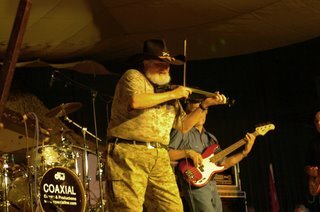 The Charlie Daniels Band -- very entertaining -- very great concert!!! 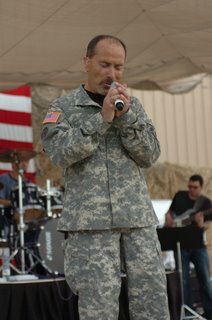 Camp Arifjan (here in Kuwait) set an attendance record for the outdoor stage entertainment. Estimated 5,000 fans slapping knees and whatever in time to the great fiddler. Of course, he brought the house down with the finale. He's got to be at least 70 years old -- perhaps older. We discovered a purpose for Peeps -- you know the yellow marshmallowy things that used to be only at Easter and now come in all sorts of colors -- purple, blue, pink, and the standard yellow. They come in all sorts of shapes -- chicks, rabbits, pumpkins, etc. You name it -- there's a Peep for every occasion. Put them in the microwave and watch them grow!!! What a riot!!!! I think we've been in the desert too long. 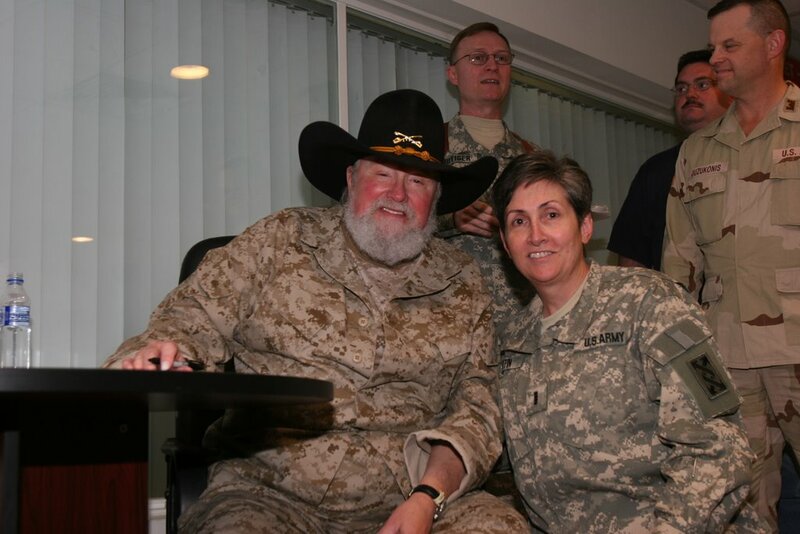 USO shows are still a huge highlight to soldiers in theater. 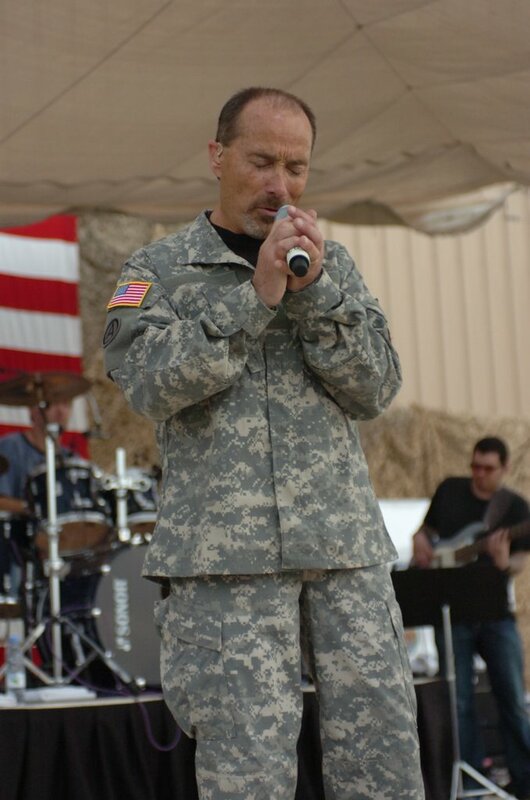 Lee Greenwood put on a fabulous show. What a talented guy -- not bad for a 63-year old!!!! He closed the show with GOD BLESS THE USA. When he started to sing it, I felt like we were all preparing for the National Anthem, as everyone immediately stood up for his closing song. When you think about it -- that song is probably the closest to the National Anthem as any song will ever be!!!! What a show -- if you didn't feel proud to be an American at the end of the show -- there's definitely something wrong!!!!! The Country-Western Band -- Restless Heart was also on the same USO Tour -- great songs from the 80's. The New England Patriot Cheerleaders were there, but did absolutely nothing for me the way they jumped around the stage, etc., etc., etc.